This photo was taken in 1969. The CAP unit is 3 2 2. You can add it to the web site if you wish. 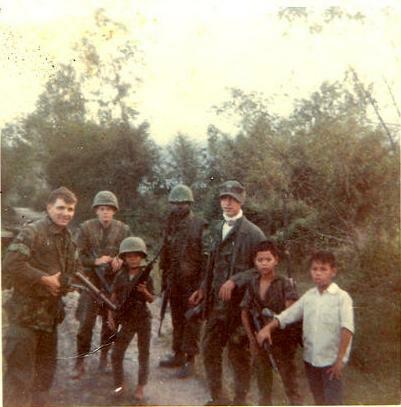 I'm carrying the M79; the fellow in the white turtleneck was nicked named "Rabbit". The black Marine is our radio operator. He contacted me, got info from website to me. You have a great site. I will send more photos. We are in a small village called Nuc Noc, which means Sweet Water. We were going on ambush.